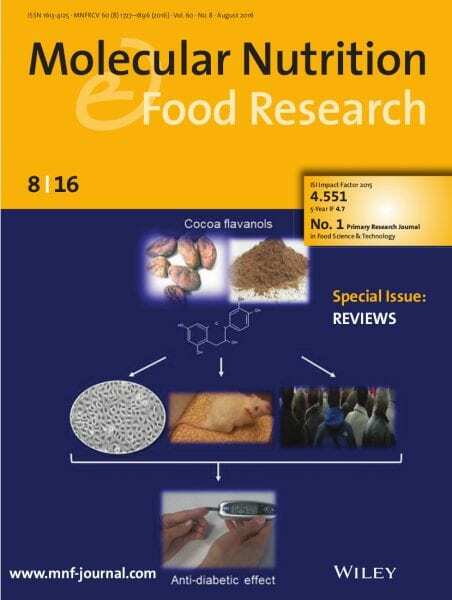 The Reviews Special Issue in Molecular Nutrition & Food Research features review articles discussing health, safety, and various aspects of molecular nutrition. Read and learn about topics such as the influence of polyphenols on inflammation, blood pressure, and other risk factors for developing type 2 diabetes; the effect of maternal obesity and weight gain on microbial diversity in the gut and breast milk; or glycative stress as a factor in cancer onset and progression. This article was highlighted on the cover the Reviews Special Issue. The review by Maria Ángeles Martin, Luis Goya, and Sonia Ramos is featured on the front cover. It discusses the role of cocoa flavanols as potential anti-diabetic agents. It is highlighted that current in vitro studies, investigations on animal models, and human interventional studies support a prominent role for cocoa and its flavanols to prevent or delay diabetes mellitus type 2.